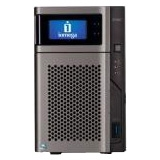 The Iomega® StorCenter™ px2-300d Network Storage 2-bay is a high performance business class desktop device, ideal for small-to medium-sized businesses and distributed enterprise locations like branch and remote offices, for content sharing and data protection. Powered by EMC® storage technology using server-class hard disk drives or a diskless option, the StorCenter px2-300d device is easy to setup and manage, and affordable to own. The StorCenter px2-300d provides cross-platform file sharing and simultaneous iSCSI block access. High performance I/O is achieved through dual GbE connections with port bonding and link aggregation capabilities. The Iomega Personal Cloud technology offers unparalleled simplicity and versatility for data protection and access. Business users will appreciate the robust data protection features such as the EMC Atmos cloud Connector, EMC Avamar data deduplication, RAID protection with hot swap drives, UPS support, built-in McAfee VirusScan, user quotas, device-to-device data replication and certification for most virtualization environments. Active Directory support and remote access round out the comprehensive business features. The StorCenter px2-300d also embeds the MindTree® SecureMind video surveillance application along with support for PC, Mac® and Linux® clients.